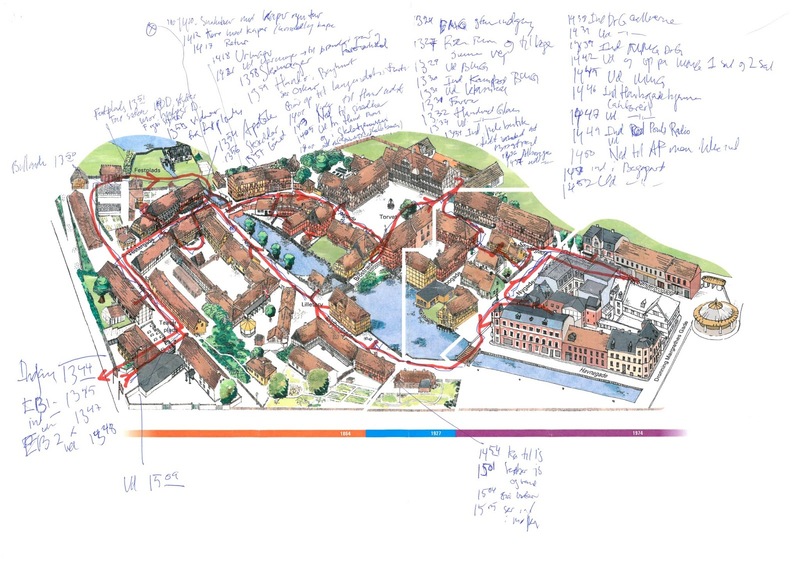 This week, I've had multiple conversations with colleagues in the arts, symphonies, and urban planning about the fear professionals have about "losing control" when opening up new opportunities for people to participate. Their questions made me think about a blog post I wrote in 2008, The Future of Authority. We are still grappling with fears of losing control as we open up organizations to new participants and new communities. This post provides some useful perspective if you have these fears or are grappling with those who are fearful. 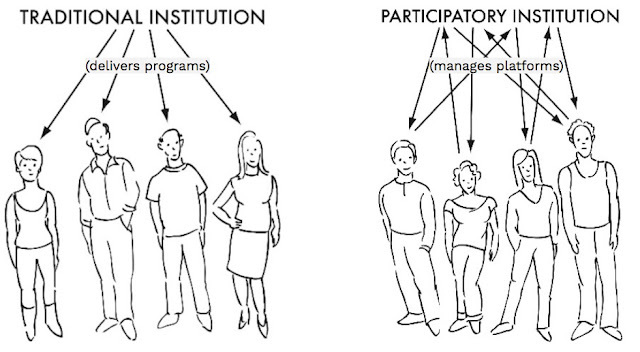 While I originally wrote this post to advocate for more participatory practice (i.e. letting museum visitors contribute and collaborate in museums), I now see this as a crucial issue also for more democratic and inclusive practice (i.e. welcoming people with more diverse perspectives and backgrounds to participate meaningfully). Around the world, we see that participation is a meaningful entrypoint for new communities. New communities don't just want to consume. They want to help shape organizations to more fully represent and embrace their realities. 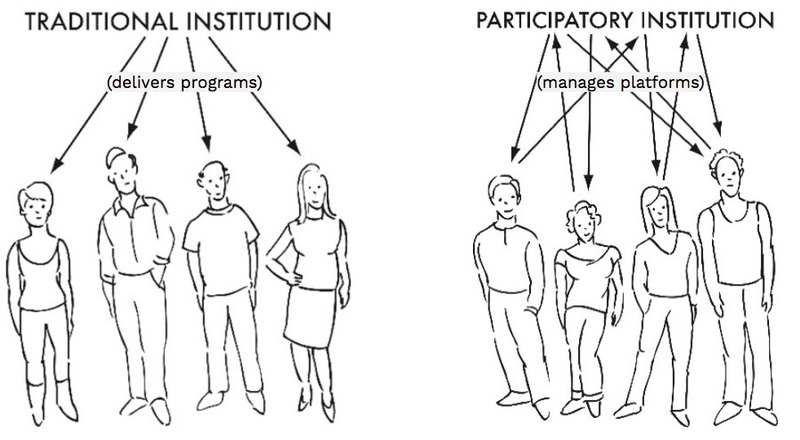 Inviting participation, letting go of control, holding expertise, and sharing power is critical to inclusive practice. Our collective understanding and savviness about the power online platforms wield--for good and ill--has greatly increased since 2008. As I reread this post, I think about the incredible opportunities (and risks) for cultural and civic organizations - rather than publicly-traded tech companies - to create and manage platforms on which people connect, share knowledge, and participate in civic life. With no further ado, enjoy this post. Other person: "So, you think that museums should let visitors control the museum experience?" 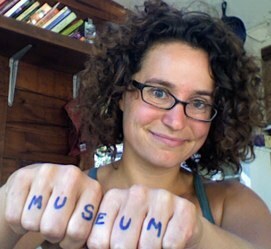 Other person: "But doesn't that erode museums' authority?" One of the primary fears museum professionals (and all professionals) have about entering new relationships with audiences is the fear of losing control. For hundreds of years, we've owned the content and the message. While we may grudgingly acknowledge the fact that visitors create their own versions of the message around subsets of the content, we don't consciously empower visitors to redistribute their own substandard, non-authoritative messages. So when people like me start advocating for the creation of tools and opportunities by which visitors can share their stories, reaggregate the artifacts, even rate and review each others' creations, museum professionals of all stripes get concerned. If the museum isn't in control, how can it thrive? We have to change the framing of this conversation. There is a difference between control and expertise. In these conversations, people often say, "don't expert voices matter?" and my emphatic response is YES. Content expertise matters. Content control shouldn't. Museums should feel protective of the expertise reflected in their staff, exhibits, programs, and collections. In most museums, the professional experience of the staff--to preserve objects, to design exhibits, to deliver programs--is not based on content control. It's based on creation and delivery of experiences. And in a world where visitors want to create, remix, and interpret content messages on their own, museums can assume a new role of authority as "platforms" for those creations and recombinations. The problem arises when expertise creates a feeling of entitlement to control the entire visitor experience. Power is attractive. Being in control is pleasant. It lets you be the only expert with a voice. But if our expertise is real, then we don't need to rule content messages with an iron fist. As Ian Rogers has said, "losers wish for scarcity. Winners leverage scale." Single voices represented on single labels is not scalable. I believe we need to develop museum "platforms" that allow us to harness, prioritize, and present the diversity of voices around a given object, exhibit, or idea. This does not mean we are giving all the power to visitors. We will grant them a few opportunities--to create their own messages, to prioritize the messages that resonate best for them personally--in the context of a larger overall platform. The platform is what's important. It's a framework that museums can (and should) control, and there's power in platform management. These powers constitute a set of controls which constitutes a real and valuable authority. Let's take a look at each one and how it might be applied in museums. 1. The power to set the rules of behavior.User-generated content sites control user and community behavior, both implicitly through the tools that are and aren't offered, and explicitly through community management. Every Web 2.0 site has rules about acceptable content and ways that users can engage with each other--consider this article about the complicated and often highly subjective (read: powerful) Flickr community guidelines. These rules are not uniform, and their differences often influence the makeup of users who feel welcome and choose to engage. When it comes to museums, comparable rules can guarantee that the museum remains a safe, welcoming place for visitors of all kinds. There are some "rules" already in place--like the rule that you have to pay to enter--that may have great effect on the types of users who engage in museums and the behavior they display within. Museums should consider, as Web 2.0 community managers do, what behaviors and visitors they want to support and which rules will make those people feel most at home in the institution. 2. The power to use and exploit user-generated content.Platforms also have the power to set rules related to preservation and ownership of the content on them--often with quite strict IP statutes that favor the platform over users. Every time you post a photo on Flickr, you give its owner, Yahoo!, the right to use that photo however they see fit. The same is true on YouTube, and on sites like Facebook, which are "walled gardens," you can't even easily export your user-generated content (friends, events, updates) outside of Facebook itself. Again, these rules reflect platform control, and when the control is too heavy-handed, users get annoyed and stay away. Museums will always need to retain some powers to manage the preservation of objects, to wield IP controls properly, and to manage the digital reproduction and dissemination of content. There are many models as well for what we do with user-generated content in the museum. There are some emerging case studies for this. The Smithsonian American Art Museum's current Ghosts of a Chance game is accessioning player-generated objects into a temporary part of their collection database, with clear rules about what happens to the objects at the end of the game (they are the responsibility of a sub-contractor). In the same way that Web 2.0 sites display a range of respect for user-retained intellectual property, museums can navigate and create their own rules--and related powers--for content developed by visitors on site. 3. The power to promote and feature preferred content. When you go onto a user-generated content site like YouTube, you don't just see a jumble of videos. One of the greatest powers retained by these platforms is the power to feature content that reflects the values of the platform. These values may skew towards promoting content with the most popularity/views, the newest content, or content that is unique in some way. The choice of what to display on the front page is not just about design. There have been huge user-protests of both YouTube and Digg for perceived bias in the "featured content" algorithms that vault some content to the top. And while some sites strive for transparency, most find ways to feature the kind of content and behavior that they want to see modeled for other users. This may be the most important platform power when it comes to museums because it is the one that allows the platform to present its values and model preferred behavior. And many museums are far from assuming this power. Most museum projects that allow visitors to create content only allow for the most basic of prioritization. Consider video kiosks where visitors can create their own short clips (a pet peeve of mine). Many museum video kiosks will feature clips from famous people but do nothing to prioritize and prominently display high-quality visitor submissions. The kiosks are organized by recency, not content value--and so new visitors walking up are not given a model for the kind of content the museum would most like to receive. When museums do assume this power, it is often in a zero-transparency way that doesn't model behavior for users. When I spoke with Kate Roberts about MN150, the Minnesota History Center exhibition based on visitor-generated nominations, she explained that after the nomination period was over, they entirely shut down visitor engagement in the selection process. It just felt too messy to do anything but lock the staff in a room and sort through the nominations. When the exhibition opened a year later, visitors could see which nominations were valued and featured, but they couldn't get this information in an early feedback loop that would have allowed them to improve their nominations during the submission process. 4. The power to define available interactions. This power is so basic that it is often forgotten. On YouTube, you can share videos. On Craigslist, you can buy and sell stuff. On LibraryThing, you can tag and talk about books. Each Web 2.0 platform has a limited feature set and focuses on one or two basic actions that users can take. Museums don't need to offer every kind of interaction under the sun--we just have to pick the few interactions that most support the kind of behavior and content creation that we value. Again, there's a lot of power in the decision of whether visitors will be allowed to contact each other, rate artifacts, or make their own exhibits. As long as you create a platform that is consistent in its values and the interactions provided, you will be able to control the experience as you open up content authority. There are real opportunities here for museums to retain authority related to values, experiences, and community behavior. The power of the platform may not let you dictate every message that floats through your doors. But with good, thoughtful design, it can ensure that those messages enhance the overall museum experience.